Broadband took a step closer last week when BT finally decided on action. They have not solved the software problem to install fibre-to-cabinet, so they will be attempting to install fibre-to-premises for all occupied homes that want it. Read this leaflet for more details. Now we need your help. BTOpenreach provide the cabling for fibre, irrespective of who your service provider is. Now they need to know the number of people who genuinely want fibre on Walton Grange so that they can put in nodes with enough capacity – so please follow this link and email Jenni on [email protected] with the information requested on the form at the end of the leaflet. If you got the leaflet around lunchtime on Sunday, we missed a question out! Please let Jenni know who your current internet provider is, as that’s one of the compulsory questions BTOpenreach ask in order to register you. Walton Grange residents say what they think! Sorry about the lateness of this update. 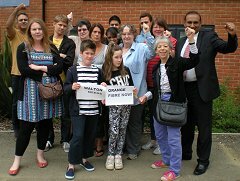 Just a few weeks after residents celebrated success after BT planned to install fibre in Walton Grange this summer, they were disgusted by the news that BT had put the plan back to next year! Thanks to all the residents who turned out and emailed to make the point to BT that Walton Grange needs broadband. It helped – when we met with BT a couple of weeks later, they certainly knew about Walton Grange’s plight! At first no explanation was given. But now BT have explained that the software routing broadband signals cannot cope with the cabinet connecting to both fibre-to-cabinet and fibre-to-premises! Residents in Walton Hall and parts of Walnut Tree are also affected by this problem. The Focus team is helping residents to keep the pressure up on BT! You’ve Done It! Fibre is Coming! Cllrs Jenni Ferrans and Subhan Shafiq – Walton Grange will now get fibre this summer. Months of arguing by the Lib Dem Focus team and lots of lobbying from residents in Walton Grange has finally paid off. Walton Grange will get fibre broadband this summer! Lower speed fibre contracts from BT that will give reliable broadband at around 30mbps currently start at £10 per month once you’ve got a landline. Other providers may start offering fibre contracts a few months later. Contracts for Fibre to the Premises should also be available after that – currently giving 140 mpbs. Thanks for helping get the message across to BT. They were really aware of the message they were getting from residents! Jenni said; “Now we need to work on other ‘not spots’ locally. Please see our guide to what’s proposed and contact us if you need fibre broadband and won’t get it under the current plans”. Like many people Cllrs Jenni Ferrans and Subhan Shafiq have fast broadband – but can you get it in your area? BT published its plans recently for the government-funded fibre project and it’s mixed news for our area. Fibre is needed to get even moderately good speeds, not just fast and superfast, in our area (because we’re a long way from the telephone exchange and copper wire broadband slows down with distance), so this will benefit a lot of people and it’s really important that everyone gets the option. Fibre-optic broadband will be available to most households in our area that want it by 31st March and most of the rest during 2014. But a few will wait longer, and some may not get it at all on this project. The details we know at present are below. If you’re not satisfied with the timetable, contact us to help us campaign! Phase 8: NOT fibre. Some speed-up to 2mbps on copper cables – in 2016! Flats anywhere: by negotiation with the owners of the building. Please let Jenni Ferrans know if you need that resolved. Bridlington Crescent some of nos 1-9 and 2-22, and all of nos 11+ and 24+, Abbeydore Grove, Aylesford Grove, high numbers in Stanbrook Place, Tynemouth Rise, Leominster Gate, St Helen’s Grove to be covered in Phase 1. Kilwinning Drive some already covered. Higher numbers of the rest and Waverley Croft to be covered in Phase 1. The rest to be covered in Phase 3. Exact split awaited! Tamworth Stubb, Cinnamon Grove, Celadine Court, Sandbrier Close, Samphire Court, Berberis Close, Tatling Grove, Cloudberry, Tarragon Close, Twinflower, and part of Boxberry Gardens are in Phase 1. Parts of Walton Road, Boxberry Gardens, Pinfold, Honeysuckle Court will be covered in Phase 1, but parts are in Phase 8. Exact split on these awaited! Every street in Walton Grange is marked as split between Phase 1 and Phase 8. We think that’s technically impossible – so we’re pressing for details! New houses finished after the start of August will not necessarily be covered at all. We’re campaigning for the whole estate to be cabled with at least fast broadband speeds – this is the part of the ward where copper cable speeds are lowest. The houses near the OU are not mentioned at all – BT appear to have forgotten about them. We’ve reminded them! We’re waiting to hear.